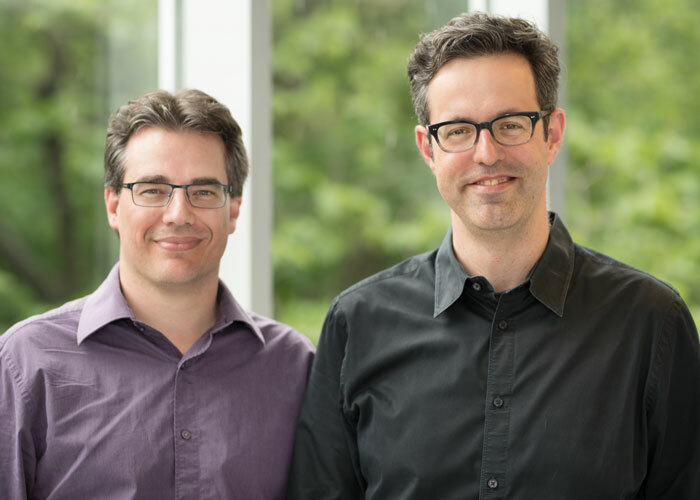 The co-directors of the Data Philanthropy Hub, (left to right) Marc Fredette and Renaud Legoux. The Data Philanthropy Hub was officially launched on June 7, in the L’Oréal Room at HEC Montréal. The project was initiated by AIMIA, a Montréal marketing firm, and supported by the Institute for Data Valorization (IVADO), to mark the city’s 375th anniversary. The launch was also the opportunity to officially announce the two co-directors of the Hub, Professors Renaud Legoux and Marc Fredette. For its first year, the Hub has chosen to focus on cultural organizations, by working with the Quartier des spectacles Partnership. The goal is to advise these organizations on data valorization. This philanthropic initiative will help cultural partners better analyze their markets and apply best practices. It will also concentrate on knowledge transfer and know-how in data analysis, so as to provide Montréal with an ecosystem of researchers and firms with top-flight expertise in this area. This data sharing made it possible to confirm or disprove certain assumptions during a first analysis exercise held in March, for instance concerning the differences between the various Quartier des spectacles audiences, or as regards the advisability of developing group offers. “When you don’t understand the data, your choices are based on intuition and experience. The idea here is to move beyond common sense and try to improve practices by basing decisions on facts,” says Marc Fredette. To build on this knowledge, the two professors created a summer school for master’s-level HEC Montréal students, a continuation of a data analysis course. The idea was to have them use the data to develop their consulting skills in this area. Over the past month, the students conducted an exercise using key data from four cultural organizations: the Théâtre du Nouveau-Monde, the Maison-Théâtre, Club Soda and the Théâtre Saint-Denis. This practical consulting experience culminated during the Philanthropy Days held at HEC Montréal on June 7 and 8, following the launch of the Hub. Master classes and coaching sessions gave the students a chance to put the finishing touches on their project, for instance by learning to properly identify clients’ needs or present data appropriately. The two days wrapped up with the students presenting the different “offers” to their partner-clients and a networking cocktail party.